This week I am featuring Kathy Gardiner from The Naked Gardiner. 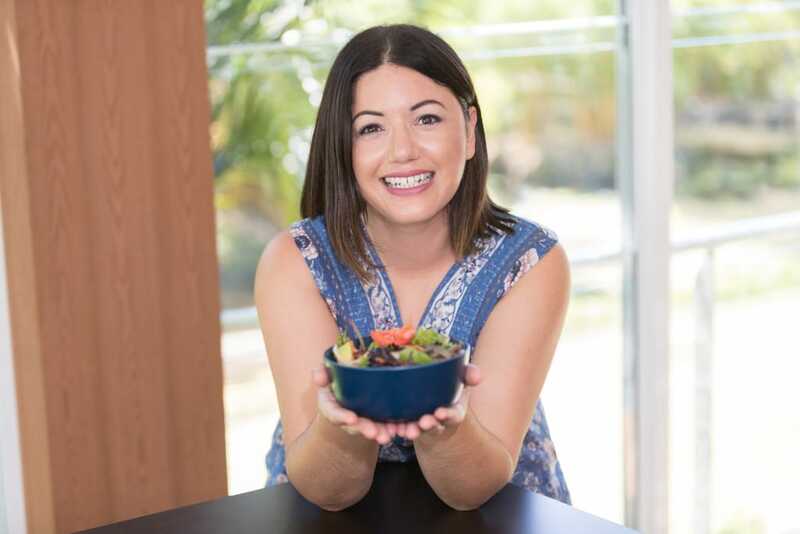 Kathy is a very inspirational woman who has transformed her life through clean eating and toxic living after being diagnosed with Stage IV Metastatic Melanoma. Hi, thanks for having me Ness! I feel very honoured to be part of your Foodie Friday! I became The Naked Gardiner in jest, when I began creating plant based dishes and taking them to get-togethers with friends but The Naked Gardiner was really born when I decided to share my life with the world and allow my followers the opportunity to enter the rollercoaster life that I live. At the time I had been told that I had intransit metastatic melanoma and was I undertaking radiation treatment in a hope that it would stop the spreading, unfortunately it did not and I was diagnosed with Stage IV Metastatic Melanoma soon after. I quit working as a CEO’s Executive Assistant to focus on my health and my healing, and began to truly concentrate on blogging about my journey and the loves in my life by encouraging my followers to view the world in a different light. My love of mindfulness, food, sustainability, self care and my two favourite boys (my husband Anthony and our healing pup, Winston the French Bulldog) while creating disease awareness are the basis for what I am passionate about. When I was told that I was a “watch and wait patient” and that I should go and live my life, I sat there in a cold hospital room and decided that wasn’t good enough advice for me. Since that day I have very much transformed the life I once lived to one where the choices I make are for my wellbeing, to support my immune system and to live mindfully. I am passionate about knowing where my food comes from and supporting our local producers and suppliers. It has also inspired my husband and I to take a more personal approach in raising awareness about Advanced Melanoma, which unfortunately is Australia’s national cancer and the leading cancer amongst young people. The first thing I would suggest is taking note of what you do want in your life and what you don’t. When you have realized the true reason why you want to transform to a healthier lifestyle you will be more inclined to stick to it and it will become second nature. Also you will find that once you remove the things that are holding you back, the freer you will become and life will take on a whole new light! Remove the guilt. When I say remove guilt I mean that nasty voice in your head that knocks you down and reprimands you. Everyone is allowed some indulgences in their life in whatever form that comes in but beating yourself up about it for long periods of time will only cause you to sabotage your objective. Life is all about creating balance! Take Pause! Life gets crazy! Believe me I know! If you take a moment to pause, breathe and calm your mind, you will find a new sense of clarity! Nothing is stopping you from achieving… but yourself! I’m probably the worst person to ask this question from! Numbers and I don’t mix, so budgets are often overblown! However my advice is only purchase what you need, and if you go wild at the markets, like I often do, then create meals around the fresh produce you have acquired. I also take advantage of my local organic wholesalers when they have market days on their bulk items. You will be surprised what savings you can achieve. How do you deal with food struggles from your family? My fur-baby is pretty demanding when it comes to food, but he’s pretty easily pleased with organic meat and vegetables. My biggest struggle is fatigue, I often get extremely tired so when evening comes around and I find I am less enthused about creating magical dinners like I use to be! I am sure this is the case with many people after long working hours. I am grateful that I have a lovely husband that steps in and tries his hand at preparing predominantly plant based creations even though he’s a roaring carnivore! I also find that family and friends get scared of words like plant based, vegan, vegetarian or gluten free and often give up before they realize that there is a whole world of possibilities and food groups that can be explored! I still sigh when I see menus and the only vegetarian option is a salad predominantly made on iceberg lettuce. It’s all about opening one’s mind! I love dhals served with brown rice! I love all the magical flavours and combinations that you can achieve by cooking with spices in Indian cuisine! And when there is turmeric involved, I am usually won over!!!! Adele McConnell of Vegie Head! She amazes me with her beautiful vegan creations, her love of animals, especially her fur-babies and her sincere kindness and beauty. She is a true gem! And Jessica Cox a beautiful nutritionist in Brisbane who makes the most epic pancakes! I owe my buckwheat pancake addiction to her! Kundalini Yoga! It is my saviour! I may not be able to master all the moves as I struggle with lympheodema in my right arm but I find the mantras to be amazingly healing and peaceful. When you chant you connect with your body through the symphony of sound vibrations and it is even better when you are supported in a group environment as the energy through sound is phenomenal. I also love reading, being creative and taking Winston for his walks, even when he is being an out of control terror… I just put it down to him being a free spirit like his mama! What is your favourite recipe to cook? Can you share the recipe with us? The health benefits of turmeric root are vast! It is an incredibly beneficial root vegetable to include in to your diet just watch out for the yellow stains on your kitchen benches! One of my all time favourite smoothies is my Turmeric Shake! It is wonderful to enjoy on a hot Australian day, but as winter approaches you may wish to omit the ice and enjoy as a delicious milkshake! Pour the base liquids of coconut water and almond mylk in to a high-speed blender. Blend for 10 to 12 seconds commencing from a low to high speed and ensuring a smooth consistency. Depending on your blender, remember to add more liquid if your blender blades struggle. Always be mindful not to burn out your blender motor. Pour contents in to a beautiful glass and enjoy in a peaceful environment. A little more about Kathy and where you can find her. Kathy Gardiner is a life lover; blogger; a whole-foods foodie; a cancer fighter; an awareness renegade; a soul seeker; an amateur artist and most importantly a fur-mama! Battling melanoma since the age of 25 and terminally diagnosed with Advanced Metastatic Melanoma three days before her 33rd birthday, Kathy has undertaken a life transformation through mindfulness, clean eating and living, pursuing her foodie love by creating plant-based whole food recipes; exploring sustainable products while navigating a path of self-love, positivity and inner healing as she shares her honest and ‘Naked’ journey with the world through The Naked Gardiner. Granted compassionate access to ground-breaking immunotherapy treatment, Kathy continues to fight her diagnosis while on a personal mission to advocate for melanoma patients in Australia and abroad and supporting local producers and suppliers. Kathy’s mantra in life is to open the world’s eyes to living a positive; joy fulfilled and nourished life by following her mantra to… Love. Accept. Believe. Nourish. Live.